Photo by Dan Boone. Courtesy of U.S. Fish and Wildlife Service. 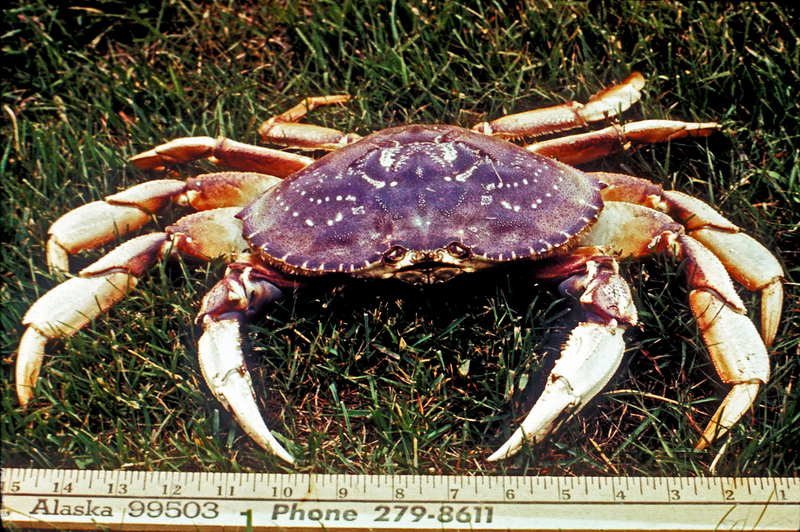 Dungeness crabs (Cancer magister) occur throughout Washington waters, including the outer coast (mostly in coastal estuaries) and inland waters. Dungeness crabs use different habitats throughout their life cycle: as larvae they are planktonic, as juveniles they are found in intertidal mixed sand or gravel areas with algae or eelgrass (Holsman et al. 2006) and as adults they are found in subtidal or intertidal areas on sand, mud, or associated with eelgrass beds. Bare habitats are infrequently used by juveniles, most likely due to a lack of refuge from predation and decreased food abundance (McMillan et al. 1995). Vegetated, intertidal estuaries appear to be important nursery habitats for young crabs (Stevens and Armstrong 1984); older crabs have been shown to move progressively into unvegetated subtidal channels (Dinnel et al. 1986, Dethier 2006). Annual settlement and survival of Dungeness crabs are typically variable. This variation stems from biotic factors such as predation and food availability, as well as abiotic factors such as water temperature and currents that transport larvae away from or toward nearshore areas. However, recruitment variability of Puget Sound populations is less than that seen in coastal populations (McMillan et al. 1995, Dethier 2006). There is evidence for local retention of Dungeness crab larvae within Puget Sound with a smaller proportion of recruits originating from coastal or oceanic stocks although this ratio is likely to vary from year to year (Dinnel et al. 1993, McMillan et al. 1995). Furthermore, the degree to which larvae originating in Puget Sound are transported through oceanic water before re-entering the sound is not well understood (Dethier 2006). As predators and scavengers, Dungeness crabs feed upon a broad range of prey including small mollusks, crustaceans, clams, and fishes. They also prey for a wide variety of taxa, which varies with their life history stage. Larvae are preyed upon by coho and Chinook salmon and rockfishes; juveniles by a wide variety of fishes; and adults by fishes, seals, octopuses, and each other (generally when molting) (Orcutt et al. 1976, Reilly 1983, Dethier 2006). Threats to Dungeness crabs include: low dissolved oxygen, variation in temperature and salinity, fisheries, habitat alteration or loss, and pollutants such as insecticides, hydrocarbons from oil spills and heavy metals. Because juvenile crabs rely on estuarine habitats and are also potentially more sensitive to toxins, early life history stages are likely to be more influenced by human activities (Dethier 2006). Due to their dependence on estuaries as juveniles, their value as recreational, commercial and tribal resources and their vulnerability to a suite of human impacts, Dungeness crab are included in the Washington Department of Fish and Wildlife (WDFW) Priority Habitats and Species List (Fisher and Velasquez 2008). However, there is currently no monitoring of Dungeness crab populations in Puget Sound that enable a reconstruction of population trends, status and sustainable harvest rates. Instead, time series of landings are used to gauge trends in population size over time. Commercial harvest quotas and recreational harvest season duration are determined from pre-season surveys that assess the relative abundance of mature females. The fishery is a male-only fishery, with a 6.25" (15.875 cm) carapace width minimum size. It is difficult to know whether temporally stable harvest rates represent stable population sizes or reflect changes in harvest effort or regulations (de Mutsert et al. 2008) Indeed, the increases in recreational landings may reflect increased fishing effort from a growing human population. Landings of Dungeness crab in Puget Sound have been highly variable, peaking at more than two million pounds in the late 1970s, declining in the 1980s, and rising again from the 1990s to 2005 (Dethier 2006). From 1995 to 2005, the biomass of Dungeness crab harvested annually by commercial, recreational, and tribal groups has shown an increase from six million pounds per season to approximately eight million pounds per season (Figure 1)(WDFW catch data, reported in Dethier 2006, PSP 2007) Increases in landings can reflect either an increase in fishing pressure or an increase in the abundance of the resource. Figure 1. Dungeness crab harvest (commercial, recreational and tribal) landings from 1995 to 2005. (WDFW catch data, reported in Dethier 2006, PSP 2007) http://wdfw.wa.gov/fishing/shellfish/crab/. Because fisheries landings can be influenced by variables such as fishing effort that do not necessarily reflect crab population abundances, trends in landings data are not considered a reliable indicator of population status (de Mutsert et al. 2008). WDFW has estimated Dungeness crab abundance using a closed ring pot survey from 1999 to the present, however data from this survey have not been published. Like many marine species with complex life histories, Dungeness crabs occupy different ecological niches throughout their life cycle and in therefore rely on multiple intact habitats. The associations between crabs and estuarine habitats, particularly nearshore habitats for juveniles may link habitat abundance and condition to the long-term health of Puget Sound Dungeness crabs. While landings data provide some information about the status of the fishery, they are not a reliable way to estimate natural population levels or trends. de Mutsert, K., J. H. Cowan, T. E. Essington, and R. Hilborn. 2008. Reanalyses of Gulf of Mexico fisheries data: Landings can be misleading in assessments of fisheries and fisheries ecosystems. Proceedings of the National Academy of Sciences 105:2740-2744. Dethier, M. 2006. Native Shellfish in Nearshore Ecosystems of Puget Sound. Puget Sound Nearshore Partnership Report No. 2006-04, Seattle, WA. Dinnel, P. A., D. A. Armstrong, and R. O. McMillan. 1993. Evidence for multiple recruitment-cohorts of Puget Sound Dungeness crab, Cancer magister. Marine Biology 115:53-63. Dinnel, P. A., O. Russell, D. A. McMillan, D. A. Armstrong, T. C. Wainwright, A. J. Whiley, R. Burge, and R. Bumgarner. 1986. Padilla Bay Dungeness crab, Cancer magister, habitat study. Washington Department of Ecology, Seattle, WA. Fisher, W., and D. Velasquez. 2008. Management recommendations for Washington's priority habitats and species: Dungeness crab (Cancer magister). Olympia, WA. Holsman, K. K., P. S. McDonald, and D. A. Armstrong. 2006. Intertidal migration and habitat use by subadult Dungeness crab Cancer magister in a NE Pacific estuary. Marine Ecology-Progress Series 308:183-195. McMillan, R. O., D. A. Armstrong, and P. A. Dinnel. 1995. Comparison of intertidal habitat use and growth-rates of 2 northern Puget Sound cohorts of 0+ age Dungeness crab, Cancer magister. Estuaries 18:390-398. Orcutt, H. G., R. N. Tasto, P. W. Wild, C. W. Haugen, and E. E. Ebert. 1976. Dungeness crab research program. California Department of Fish and Game. PSP. 2007. 2007 Puget Sound Update: Ninth Report of the Puget Sound Assessment and Monitoring Program. Olympia, WA. Reilly, P. N. 1983. Predation on Dungeness crabs, Cancer magister, in Central California. California Department of Fish and Game, Sacramento, CA. Stevens, B. G., and D. A. Armstrong. 1984. Distribution, abundance, and growth of juvenile dungeness crabs, Cancer magister, in Grays Harbor estuary, Washington. U.S National Marine Fisheries Service Fisheries Bulletin 82:469-483.